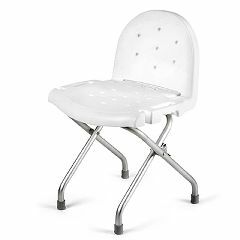 Invacare's Folding Shower Chair provides a safe seating surface in the bathtub and can be folded for quick storage or transport. Seat To Floor Height: 17-1/2"
Seat Width:	19 - 3/4"
Overall Width: At Base: 16-3/4" Folded: 19-3/4"
Overall Depth: 17 - 3/4"
Depth Folded: 7 - 1/2"
Back Height: From seat = 12"
I use when taking showers, very sturdy,I noticed there is water in the back part,its in there but doesn't come out. I am a contractor that remodeled small bathroom for a customer with mobility problems. The chair they had was old and did not fold. In the small bathroom, it was always in the way. This folding chair frees up that floor space and helps the bathroom look neater. The customer has had the chair for a week and loves it. Said it was perfect! Sturdy. Safe. Lightweight. Functional. Easy To Install. Practical. Bargain Hunter. Budget Shopper. Midrange Shopper. I like the chair, I haven't used it in the shower yet. It fits in my tub. In my experience, I had to figure out how to assemble it. It took me about 20 minutes to do it with the help of pictures on the box, assembly instructions. The item was delivered on time. I would recommend this product to a friend or to you if required. Hope this review helps you. Sturdy. Lightweight. Functional. Easy To Install. Safe. Comfy seat; easy to set up/take down, stores in a small space; can be moved from room to room or house to house. What's not to like? I do wish it had removable arm rests, though. Here is a picture showing how it looks folded. Although the description states this is a folding chair, I need to know if both the back folds down as well as the legs fold together for easy storage. Asked on Apr 18, 2013 3:40:16 PM by Missy from Fl. Yes. Please see the picture. I realize that this was asked a long time ago, but I am looking at buying it now. I looked it up on Invacare's website and found a picture. Opened up to sit on, the width of the legs is 16 3/4 inches. The legs measure 17 3/4 inches from front to back. What are the measurements of the legs front to back and side to side? Also... will it fit in a RV bathtub? I cannot say if it will fit in an RV, but the width of the legs from side to side when open is 16 3/4 inches. The depth (front to back) is 17 3/4 inches. Hello Allegro, I just wanted to compliment the sales staff for their polite and kind service. I have recently purchased a new wheelchair from Tina, and she was very friendly and professional which made my purchase very pleasurable. I am a return customer as I had purchased an XTR from Greg earlier in the year, Greg had been very helpful in ordering the chair and reinforced my confidence in your company. I did not hesitate to come back knowing I would get prompt friendly service. Thank you to everyone involved and Merry Christmas.